Home NEWS NASA buying IDs from Mt. Kenya youth for Sh. 1,000. NASA buying IDs from Mt. Kenya youth for Sh. 1,000. 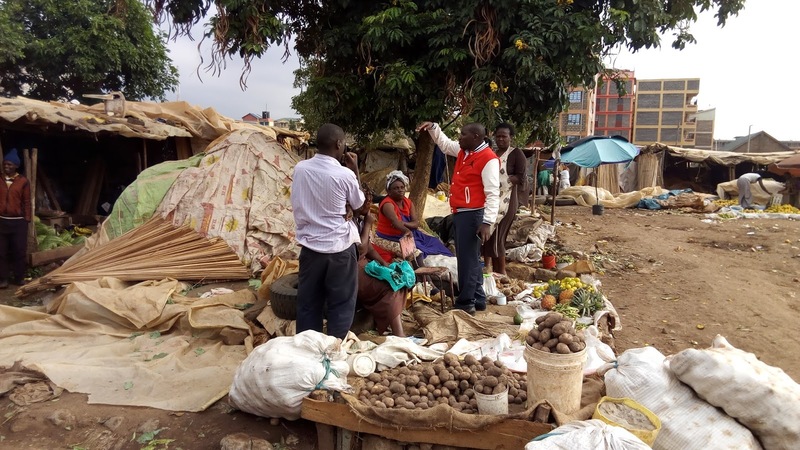 Juja Town Parliamentary candidate George Koimburi talking to traders of Juja Market when he toured the area on Thursday to discuss issues affecting them. Koimburi warned residents to be on the lookout for those who were going round buying ID cards from the youth. A Juja Town Parliamentary candidate has warned voters from the larger Mt. Kenya Region to be on the lookout of some NASA supporters going round purchasing IDs cards with intention of denting President Uhuru Kenyatta’s chances of re-election. Mr. George Koimburi Ndung’u, who is vying for the seat on a Farmers Party of Kenya ticket, appealed to security agent in the area to be very vigilant and apprehend these criminals. “Today at Kihunguro area in Ruiru Town Constituency, it was reported that there were some people who were buying ID cards from youth at KES. 1,000. These people are promising these youth that their IDs are safe and also telling them where they will collect back their IDs on the 10th of August,” said Koimburi during a tour of Juja Market and its environs on Thursday. Koimburi said that the rationale behind this scheme was to target about 8,000 ID cards in every Jubilee Party strongholds in order to deny the bearers of these cards their right to vote for President Uhuru Kenyatta. He asked the residents to be alert and notify the police immediately they suspected any illegal ID trading in the region. The candidate added that he had already notified the OCPDs from both Juja and Ruiru who promised to investigate on the matter as it was grave serious. “We cannot afford to sit back and watch the opposition to misuse our youth by capitalising on their poor economic status to their advantage. It is wrong and against the law. I will mobilise our people to arrest anybody found buying these cards,” warned Koimburi. Koimburi exuded confidence that he will win the seat following the support of Juja residents who he said had embraced his efforts to rehabilitate former alcoholics in the area and mobilise initiatives for both the bodaboda sector and women. He said that his priority as Juja MP was to work with all stakeholders to create more jobs. “I intend to work with all stakeholders to ensure that we create as many jobs in Juja as we can. I have already started a company known as Juja Creameries Ltd whose main objective activate the dairy sector in the area,” he explained. In this project, youth will be given dairy cows, with other being provided with ATM milk machines to milk in affordable units and in a more hygienic way.